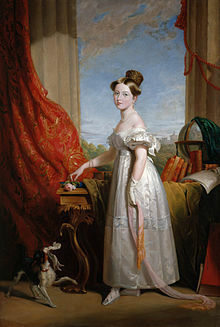 I've always been interested in Queen Victoria, my so-called namesake. My father said I had a “regal birth” (he's a doctor and I have no idea what that's supposed to mean) and so they named me Victoria. I've read many books about the queen and know that the love of her life was her first cousin, Prince Albert from Coburg (today's Germany). Their marriage was one of great love. When he died at the age of 42 from what was officially named as Typhoid (now they think he died of complications from Crohn's disease), she mourned for the rest of her life. She was crowned in 1837 and died in 1901 and was the longest reigning British monarch until the current Queen Elizabeth overtook that record. As princess, Victoria was very lonely. She lived at Kensington Palace with her mother, Duchess of Kent and Strathearn and her mother's comptroller, Sir John Conroy. The two of them devised a plan to keep Victoria safe and well called the Kensington System. Victoria wasn't allowed outside the Palace and had to hold someone's hand while going up or down the stairs (so she wouldn't fall). One day, Sir Conroy brought a young dog to the palace to give to the Duchess. Victoria took one look at the King Charles Spaniel named Dash and fell in love. I'm pleased to announce my new book, “Dash and Victoria Find True Love.” Dash loves his Queen but when Prince Albert comes he must learn that his heart is big enough to love more than one person. This book will be launched in May, 2019 in honor of Queen Victoria's 200th birthday.